This first mover advantage has proven to be influential in their success. As of December 2018, they are one of four crypto exchanges in the world with more than 100,000 active users (and the only one based in the United States). Officially, they claim “20M+ customers served” and “$150B+ in digital currency exchanged”. There’s no doubting the position they have as a powerhouse in the industry. Of course, when you’re at the top, there’s a big target on your back. They dominate the U.S. market at the moment, but the wide-open competition of the crypto industry has allowed a number of competitors to build product offerings with comparable levels of service. At this point there isn’t a clear winner that can lay claim to being the best option, but there are some great choices available if you’re wondering what other apps are like Coinbase. Beginner friendly. This is a bit subjective, but it means that you should be able to get started and purchase crypto without any advanced trading knowledge. Widely available. The service has to be available to a majority of the United States population (some States can be excluded). No wire transfers required. Funding has to be available with a normal U.S. checking account or debit / credit cards. Price markup needs to be reasonable. Many websites will offer direct crypto purchases to U.S. residents with a bank account or credit card, but will charge an obscene markup from the current spot price. Coinbase has a markup of roughly 4%, so that’s what we’re aiming for. Android and iPhone apps. Coinbase is largely successful due to convenience, so any self-respecting competitor will need the convenience of a mobile app. If all you care about is buying and using Bitcoin, Square’s Cash App is the most impressive challenger to Coinbase in the United States. Cash App is a great personal wallet app that is primarily aiming to be a competitor to Venmo and Paypal. They jumped into the crypto world by adding the option to buy and sell Bitcoin in January of 2018. Set-up is easy and involves downloading the app, creating an account, then connecting either a bank account or credit card for funding. As you can see, while Cash App is excellent if you’re interested in Bitcoin, it is severely lacking in regards to altcoin options. There are none available in contrast to the selection on Coinbase of BAT, Bitcoin Cash, Ethereum, Ethereum Classic, Litecoin, ZCash, USDC, and 0x. Even though there is a lack of altcoins, Cash App does stand out from Coinbase thanks to its generous fee structure. While Coinbase will charge a roughly 4% markup via fees, Cash App’s fee hovers around 1.5% based on my own personal use. Cash App also performs the vital function of allowing you to withdraw the bitcoins you purchase via their platform. This means that if you actually want to use your purchased bitcoins (as opposed to simply buying as an investment), you will be able to move them to a personal wallet via the withdrawal function. Keep in mind that this does not flow both ways. Users are currently unable to deposit bitcoins to sell on the Cash App. So, if you take coins off the app, you will need to find a different service if you later decide to convert the bitcoins back to USD. 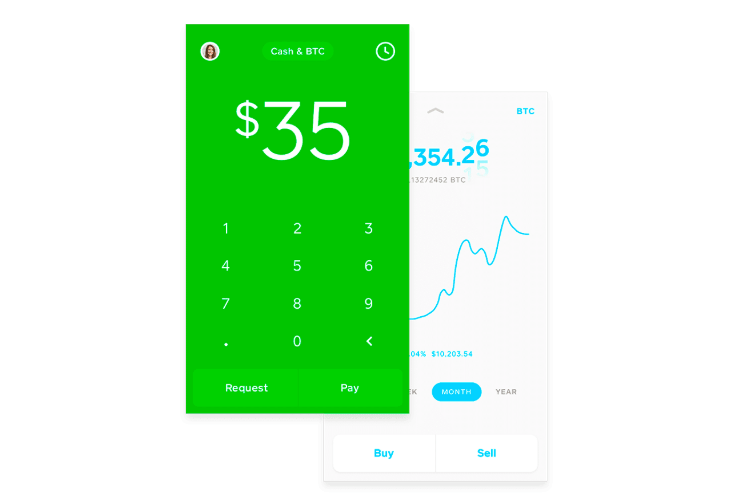 Cash App says they’re “working hard to bring support for bitcoin deposits from third party wallets to Cash App.” While this may be frustrating to some users, others may appreciate the elegant simplicity of the app. It has a function (buying BTC) and performs it well. Square CEO Jack Dorsey is also a public Bitcoin maximalist which has made his app a darling for supporters of crypto’s oldest currency. To try out Cash App, you can use my referral link below (you’ll receive a $5 credit and I will as well). If you’re looking for a simple platform that more closely matches Coinbase’s selection of cryptocurrencies, Abra will likely be your provider of choice. They actually far exceed the selection of the market leader with the ability to invest in 30 different cryptos via the same app. Set-up is simple just like Cash App with a quick app download and bank account / credit card connection process. But there is one interesting quirk. You will need to ensure that you write down the seed phrase tied to your Abra account. This phrase is a string of words that will be generated when you first install the app. If you lose this phrase, you lose access to all funds in your account so it is vital that you save it in a secure location. While the other services in this article take care of managing your balances for you, Abra is (for better or worse) closely aligned with the cryptocurrency ideals of independence and decentralization. They state “The Abra model is 100% peer-to-peer, with no middle man ever holding, managing or touching your funds at any point in any transaction. So you are in control of your money!” This is nice because you are guaranteed that Abra can’t run off with your crypto. Managing the safety of your money is entirely in your hands. While this selection is impressive, it does come with caveats. You are allowed to invest in these cryptocurrencies with Abra, but users cannot actually withdraw or deposit them via personal cryptocurrency wallets. Abra only supports deposits and withdrawals of so-called “native coins”. These are Bitcoin, Bitcoin Cash, Ethereum and Litecoin. Abra seems obsessed with pushing the limits of what they can offer. There is also an indice product to purchase a basket of 10 cryptos and they recently rolled out stock and ETF investing backed by Bitcoin. 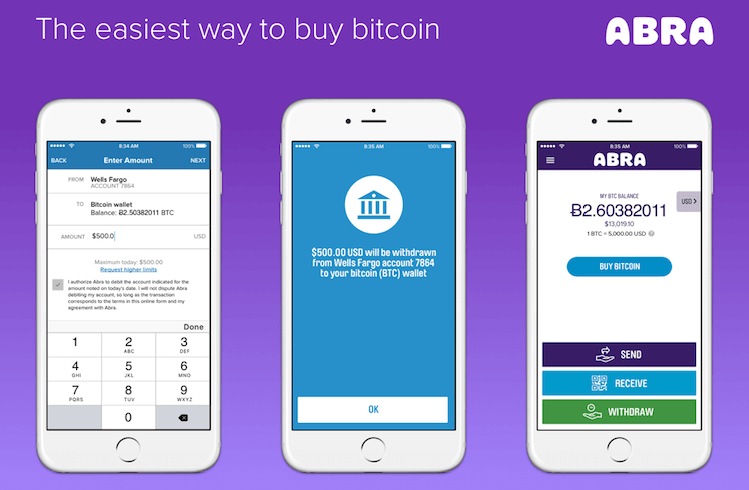 With an impressive list of features and more being announced every day, Abra seems committed to continuing their progress as a worthy option for U.S. users. You can get started using the referral link below. While all the other options on this list seem to stand out in their own way, Gemini is the closest competitor you can find that appears to want to directly eat Coinbase’s lunch. Founded in June 2013 by the infamous Winklevoss twins, the exchange has been running since 2015 but was slow to offer a retail product to individual investors as they sorted through the regulations of all 50 US States. However, all (save Hawaii) are now active. The Gemini product offering is extremely similar to Coinbase as you’ll see in the comparison table below. Gemini even offers their own US Dollar stablecoin that is built on Ethereum just like the USDC stablecoin. However, there are a few key differences between these two when you pull back the curtain. You can access Gemini via desktop or their iPhone and Android apps. Registration is fairly simple and once you have a bank account connected you will be ready to purchase cryptocurrency. Gemini’s fee structure adjusts dynamically based on how much you are buying via their app. Fees are subject to change, but as of this article’s writing fees for a $50 purchase were 4.5%. However, when that purchase was increased to $100, fees were 3.5%. At $300, fees were 2%. It is crucial to mention that here is a strange distinction between the desktop and app products for Gemini. While the Gemini app allows you to quickly purchase any coin via your bank like Coinbase, the desktop platform forces you to use their exchange product. This is in stark contrast to Coinbase where the desktop product looks remarkably similar to the mobile app. The inconvenience of this design on Gemini is minor and the exchange order book system isn’t that hard to figure out, but it is a little strange that such simple functionality is missing. Looking further at the issue, I think it reveals something about the Gemini mission itself. They seem to view themselves as a bit more “professional”. Sure, they offer a standard wallet product for you to store Bitcoin, but to me they don’t want the type of customer who is going to use them to make a $50 purchase of crypto here and there. They want to attract serious crypto traders and that is why the order book is front-and-center on desktop. One platform is “easy”, the other is “licensed”. Is one of these approaches better? I think that’s really up to the user. Keep in mind that Coinbase does offer a product that is aimed clearly at traders with their Pro product, so it isn’t like Gemini is breaking new ground with a regulated professional crypto exchange based in the United States. But, while the core Coinbase product clearly wants to cater to the buyer who’s making intermittent purchases while trusting a 3rd party to keep the funds safe, Gemini’s offering to this same group seems like an afterthought. All that said, there’s no arguing that Gemini offers the best match to the CB feature set. If you’re looking for an app that’s as close to the real thing as possible, this should be your clear choice. If your motivation for exploring cryptocurrencies is strictly focused on quick-and-easy investing, Robinhood may be the choice for you. They added cryptocurrency trading to their massively popular stock trading app in February of 2018. Setting up your account is done via their app, but they do request a little more information than the other providers in this article. For one, they require a Social Security Number. This is because of the stringent regulations they must comply with as a platform that sells traditional investment vehicles such as stocks. If you don’t mind providing this information, fill out the forms, connect your bank account, and you’re good to start investing in crypto. Excluded states are Delaware, Hawaii, Kentucky, Louisiana, Maine, Maryland, Minnesota, Nebraska, Nevada, New Hampshire, New York, North Carolina, South Carolina, Vermont, and Wyoming. As you may be realizing now from the Social Security Number and Excluded U.S. States, Robinhood is a platform that takes compliance and regulation seriously. They minimize their risk. While this means that less people are able to use the platform, it does offer one excellent benefit to those who do get to enjoy the platform: low fees. Robinhood has made their name in the world of stocks by offering commission-free investing, and this is no different when it comes to their crypto offering. The price you see on Robinhood for bitcoins and other cryptos is the price you get. This is because it is a true marketplace and you are buying / selling against other users directly. 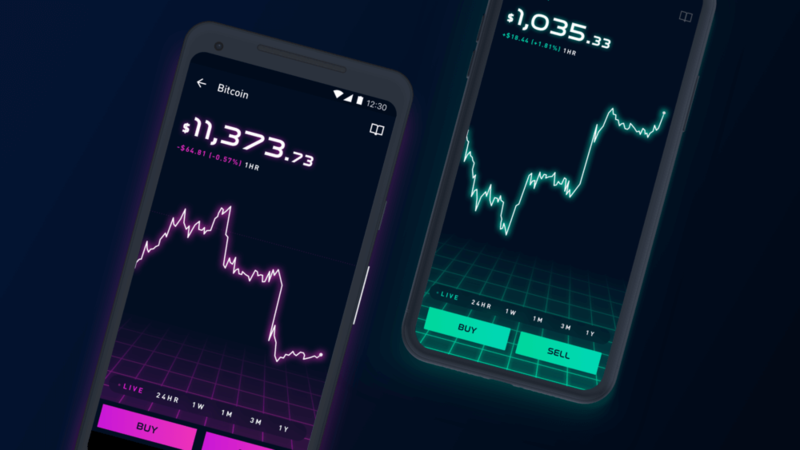 While their limited options may be frustrating to some, Robinhood is a welcome competitor that is filling an interesting use case for traditional investors that want to dabble in cryptocurrencies. It will be exciting to see how they grow this portion of their platform through the coming years. Their slick marketing and track record of success make them a dark-horse contender to become the powerhouse onramp for U.S. consumers looking to move from fiat to crypto in the coming years. As an incentive, Robinhood offers free stocks to new users that sign up up via an invitation from existing users. You can get this offer by using my referral link below. What’s Your Favorite Coinbase Alternative? And there they are, my picks for the best Coinbase alternatives for United States users. Think I missed something? Feel free to send your thought to [email protected] or to reach out on Twitter via @postersofcrypto. *Purchase fees are approximates based on personal experience and exchange rates at the time of this articles writing. All fees are subject to change based on the policies of linked service providers and the exchange rates of the various cryptocurrencies they offer. Keep in mind there are other fees that users may be charged including but not limited to balance transfer fees, withdrawal fees and crypto network fees. Always consult the terms and conditions of exchanges before making a purchasing decision. Enjoy our take on Coinbase Alternatives? Leave us a review below!